The Second Iraqi–Kurdish War was the second chapter of the Barzani rebellion, initiated by the collapse of the Kurdish autonomy talks and the consequent Iraqi offensive against rebel KDP troops of Mustafa Barzani during 1974–1975. The war came in the aftermath of the First Iraqi–Kurdish War (1961–1970), as the 1970 peace plan for Kurdish autonomy had failed to be implemented by 1974. Unlike the previous guerrilla campaign in 1961–1970, waged by Barzani, the 1974 war was a Kurdish attempt at symmetric warfare against the Iraqi Army, which eventually led to the quick collapse of the Kurds, who were lacking advanced and heavy weaponry. The war ended with the exile of the Iraqi KDP party and between 7,000–20,000 deaths from both sides combined. Kurds led by Mustafa Barzani were engaged in heavy fighting against successive Iraqi regimes from 1960 to 1975. The First Iraqi–Kurdish War (1961–1970) led to a stalemate and in March 1970 Iraq announced a peace plan providing for Kurdish autonomy. The plan was to be implemented in four years. However, at the same time, the Iraqi regime started an Arabization program in the oil-rich regions of Kirkuk and Khanaqin. The 1970 peace agreement did not last long, and in 1974, the Iraqi government began a new offensive against the Kurdish rebels, pushing them close to the border with Iran. As in the First Iraqi-Kurdish War, the Kurds received material support from Iran and Israel. Israel regarded the Iraqi military as a possible threat in case of renewed fighting between Israel and Syria (during the 1973 War about one third of Iraq's army had been sent to fight against Israel on the Syrian front) and so wished to keep the Iraqis occupied elsewhere. Iran wished to strengthen its own political and military position vis-à-vis Iraq—the only other regional power in the Persian Gulf. As the fighting progressed, Iraq informed Tehran that it was willing to satisfy Iranian demands in return for an end to its aid to the Kurds. In March 1975, with mediation by Algerian President Houari Boumédiènne, Iraq and Iran signed the Algiers Accord. According to the accord Iran would quit supplying the Iraqi Kurds in return for the transfer of Iraqi territory to Iran—especially half the width of the Shatt al-Arab, the river through which ships could sail to a number of major Iranian ports. Israel's aid to the Kurds was being transferred through Iran, so Iran's decision also prevented the continuation of Israeli aid to the Kurds (the only other possible route being Turkey which was also hostile to the idea of a Kurdish autonomy in northern Iraq as a dangerous precedent for the Kurds in eastern Turkey). Following this development, Barzani escaped to Iran with many of his supporters. Others surrendered en masse and the rebellion ended within a short time. The casualties of the war are estimated around 5,000 soldiers and civilians. As a result, the Iraqi government extended its control over the northern region after fifteen years and in order to secure its influence, started an Arabization program by moving Arabs to the vicinity of oil fields in Kurdistan, particularly the ones around Kirkuk. The repressive measures carried out by the government against the Kurds after the Algiers agreement led to renewed clashes between the Iraqi Army and Kurdish guerrillas in 1977. In 1978 and 1979, 600 Kurdish villages were burned down and around 200,000 Kurds were deported to other parts of the country. In the early 1980s, with the eruption of the Iran–Iraq War, another Kurdish rebellion erupted in northern Iraq, initiated with Iranian support. The revolt ended with a massive killing campaign by Saddam Hussein in 1986–1989. During the Al-Anfal campaign an estimated 182,000 Kurds lost their lives in north Iraq and hundreds of thousands forced to become refugees, fleeing mostly to neighbouring Iran. The area underwent chaos again in 1991 following the Persian Gulf War. Encouraged by Saddam's defeat in Kuwait, the Shi'as and the Kurds openly revolted against the Ba'athist regime. The defection of the government-recruited Kurdish Jash home guard militia gave considerable force to the revolt. Unlike the failed Shi'a rebellion in the south, the Kurdish uprising eventually led to the establishment of the Kurdish Autonomous Region. ^ a b c d e f Salama, Sammy; Al-Marashi, Ibrahim (2008). An Analytical History: Iraq's Armed Forces. Routledge. pp. 121–122. ISBN 978-0-415-40078-7. 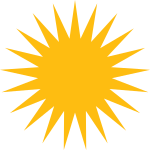 ^ a b c "Iraq (Kurds)". Minorities at Risk. University of Maryland. ^ Harris, G. S. (1977). "Ethnic Conflict and the Kurds". Annals of the American Academy of Political and Social Science. 433 (1): 118–120. doi:10.1177/000271627743300111. ^ "Introduction". Genocide in Iraq: The Anfal Campaign Against the Kurds (Human Rights Watch Report, 1993). ^ Harris (1977), p. 121. ^ Farouk-Sluglett, M.; Sluglett, P.; Stork, J. (July–September 1984). "Not Quite Armageddon: Impact of the War on Iraq". MERIP Reports: 24. This page was last edited on 24 September 2018, at 14:25 (UTC).